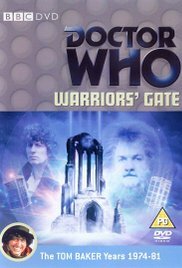 ‘Warriors’ Gate’ marks the end of the E-space trilogy, a deeply rewarding story that brings choice to the forefront as a pathway to the normal universe presents itself. It’s no secret that this season is one fraught with the looming prospect of change, and ‘Warriors’ Gate’ certainly pays respect to this season’s earlier stories and developments while boldly kickstarting the programme’s bold new direction. With Romana ordered to return to Gallifrey before the incidental E-space excursion, the return to reality poses a complex conundrum since she no longer wishes to return home after seeing the universe alongside the Doctor. With Lalla Ward’s departure from the role well-known, the question of how Romana would be written out of the show is a major driving force amidst the darker, more cerebral events on display. Indeed, the season’s recurring themes of age and change are an intrinsic part of ‘Warriors’ Gate,’ and the space freighter with aliens in suspended animation that is unable to navigate through a space where the coordinates all read zero is an intriguing if suitably depressing opening moment. Even with Biroc- one of the aliens with the ability to see some semblance of the future and thus able to navigate through hyperspace- unable to see anything until the ship’s irritable captain, Rorvik, makes the disastrous decision to make one final jump in the increasingly-decrepit ship, darker secrets quickly become known. The alien Tharils are sold as navigating slaves upon human shapes, but Biroc’s furtive visualization of the TARDIS gives him the drive to escape and seek help from whomever is aboard. As the Doctor and Romana search for the nexus point between the two universes, Biroc helps the TARDIS land in the void, leading the crew into a cobwebbed keep that once belonged to the Tharils. Through shifting time and subtle imagery, the story of how the once-mighty emperors of E-space came to be in their current indentured state as their cruelly-treated slaves built robots able to exist in the void and thus conquer the Tharils is effectively revealed. Biroc seems to accept the mantra that the weak deserve to be conquered, believing this both in the past when his species’s empire was at his height as well as in the present when his species is but a shell of its former greatness. Although the extent and power of the Tharils’ temporal abilities is not completely explored, Biroc’s desire to free the remainder of the Tharils dovetails perfectly with Romana’s desire to stay away from Gallifrey and her summons. Leaving with Biroc provides excellent closure of sorts for this long-standing companion, one who had initially joined the Doctor by Time Lord decree rather than by choice and one who underwent much more immense change- not just due to the regeneration- than many classic companions. Her final moments are unfortunately rather too rushed after some great buildup, but her decision to remain behind caps off the character’s evolution perfectly even if her desire to spurn the Time Lords implicitly means her having to spurn the Doctor as well. While Romana leaving him in no way directly leads to the Doctor’s oncoming regeneration, his desperate sadness at losing his beloved companion because of how much like him she had become certainly feeds into the swirl of emotions building up in his final episodes as the end approaches and perhaps helps to dictate the Fifth Doctor’s more humble and unassuming personality, a subjective layer of meaning to a story already brimming with layers.